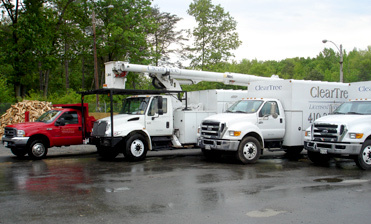 ClearTree is a Maryland Licensed Tree Expert Company. We have been in business since March 2004 and have performed more 11,000 jobs. We carry the necessary property, casualty, liability and Worker’s Compensation insurance. Tree removal and pruning is considered by the insurance industry to be one of the most dangerous jobs that an employee can perform. Worker’s Compensation insurance is very expensive. Many tree companies do not carry Worker’s Compensation insurance for their employees so that they can avoid paying this high cost. Please understand the risk of dealing with a Tree company that does not offer their employees Worker’s Compensation insurance. The employee can sue the home owner as the contractor IF the tree company does not carry insurance. The only way that you can guarantee that the tree company has insurance is to request insurance certificates be sent to you from the insurance agency(ies). Do not accept a photo copy of the certificate from the tree company as that does not confirm that the policy has been paid. You should be listed as the additional insured on the certificate. Cleartree takes great pride in employing experienced and caring crew members. Each employee goes through an extensive training program before they are allowed to work on our client’s trees. Safety is of utmost concern as well as the care of our customer’s property. Each employee has to pass a random drug and alcohol testing when working for Cleartree. Be aware that few tree companies take this approach. Drug and alcohol use in the tree industry is a serious problem. Be sure that the tree company that you choose has a drug and alcohol policy in place. We treat our employees well. Employees that enjoy their work do a better job. Our approach yields good results for our customers. Be aware that many tree companies hire low wage employees that are often inexperienced. That can lead to poor workmanship and risk to your home and property.